Now that designing events has graduated to a degree of sophistication well beyond a simple colour scheme, there are countless ways in which to integrate a theme into a corporate event. 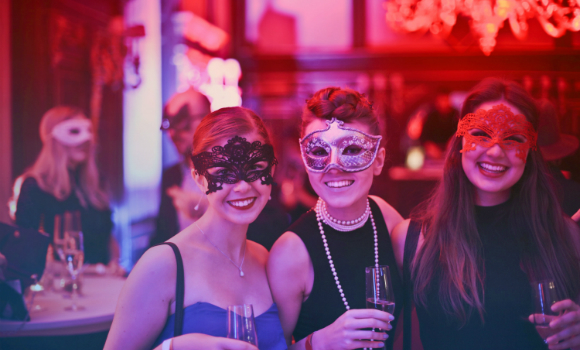 People now talk about experiences, the new means of integrating a theme into a corporate event. Attendees are no longer satisfied to sit down at a dinner offering the three traditional courses. They want more, and that more can be challenging to offer within the framework of an event’s goals and restrictions. Key to integrating a theme into an event is to ensure that the theme is first introduced through the invitation and that it is consistently evident from this beginning stage, through the middle, end and follow-up stages of the event. I announce the theme in the invite, through the event title. The invite is the first contact people have with the event and it is what will get them excited. Get creative: You can do an e-vite, a printed invitation or even a You Tube video, for something more unique. The invite is where it all begins! Pick a venue that speaks to your theme. For events on a budget, I typically suggest a venue with great atmosphere that offers chairs, linens and furniture to so that you can avoid the cost of bringing in these items. For budget-free events, you can opt for a venue that is unique and dress it up so that it speaks to your theme, bringing in bars, lounge furniture, colourful linens or tables that do not need linens. Make sure your guests are greeted at the door and feel welcomed. Consider hiring in-theme costumed actors to receive your guests. Or you might have your greeters wear an informal uniform of colourful matched ties, or ties bearing your event’s logo or name. While there is nothing wrong with the fail-safe standard of passed hors d’oeuvres and a bar, you can also switch things up with a station at which a mixologist teaches your attendees how to make the cool welcome drink they were offered in both alcoholic and non-alcoholic versions. Continue your theme with an action food station where dishes are prepared in front of your guests — it’s a great focal point for the cocktail hour. Have the event’s entertainment reflect your design and your theme. A winter-themed event could have indoor ice skating entertainers as part of the show. A spring-themed event might showcase a flower market, so that your guests leave with a bunch of in-season flowers handed out by character-attired staff stationed at the flower market stand. If you have the budget and are outside, you might incorporate a firework show or a drone show. Music is also an important component of any main event. Make sure it is consistent with your theme. If your budget allows, promote your theme through design and lighting. You can use a vinyl company to decal your bars, walls, windows and floors to ensure your design comes through in the entire room setting. Lighting is also important, pin spotting or uplighting the room creates a ambience that cannot be created by candlelight alone. Or build your atmosphere through one of my personal favourites: lots and lots of candles. For venues that offer them, drop down screens or TVs are great as decor background if you don’t need to loop logos on them. Though I believe the best experience is the best take-away you can offer your guests, if you would like to give out swag, make sure it tracks your theme! Whether you are offering a candy bag to go, a bouquet of flowers, or a memory stick, give your guests something that they will remember. Within a day or two after the event, send your guests a thank-you note in tune with your theme. Be creative here, too: Why not send a sizzle reel of the event! No matter what your theme may be, ensure that you focus on the why in every event. Inspire and immerse your guests in an event that has a clear agenda, so that the moments, both big and small, transcend the event itself. This entry was posted in Event Branding & Marketing, Event Operations and tagged event planning, event themes.